Notes: Based on the manga by Kosuke Fujishima. Keiichi and the Goddesses suddenly get a visit from Lind from the Fighting Division. 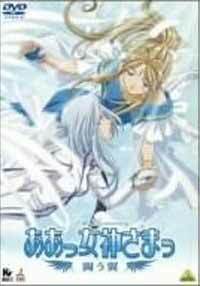 From the looks of things, Goddesses in heaven have had their angels stolen, so Lind is sent down to the temple where Belldandy and her sisters live to protect them and try to ascertain the situation and deal with the threat at hand. Having seen and loved the two first seasons of the new Ah! My Goddess TV series (I say new, although the first season is already three years old), I wasn't entirely sure what to think of this short interlude. Not that I doubt I'd like it, but this particular OAV is centered around a manga original, and the OAV sticks pretty close to said OAV for its entire runtime. The thing about this particular story is that it centers around the personality of one of the side characters. She did make an appearance at the end of the first season and the beginning of the second, so she's not really a stranger to Keiichi and the goddesses. Even so, her entry this time is immediately followed up by a complete character introduction, including various tidbits on how big a badass she is. And yes, this particular part of Ah! My Goddess is heavily action oriented, especially compared to just about any other part of the AMG anime continuum, save perhaps the whole deal with the Lord of Destruction at the end of the first season. One complaint I could quote is that Fighting Wings ain't your usual AMG fodder, which isn't entirely off base. Actually, it's quite true. For those who care, the angel eater seems to have been put through a compete redesign, which is probably the biggest divergence the show has to offer. Honestly, it looks more weird than menacing now. It's still just a tool, though. What this OAV really boils down to is basically the relationship between Keiichi and the Goddesses when it comes to the dangers they've faced and will face in the future as well. Oh, and Lind is totally, totally a badass. This show isn't going to turn anyone into AMG fans, although that's mostly because it is more of an interlude than a season or a show on its own, so I'm guessing those of you who are reading this want to know how it stacks up with the rest. And honestly? It's like one of the weaker episodes, which is to say that your entertainment is going to be heavily reliant on your fandom and whether you care for battle scenes and preparations to said scenes. Only the completist among you will know whether it's something you would like to add to your collection. Recommended Audience: Ah! My Goddess has never been known to contain all that much in the way of prohibitive material. This being "AMG: Shounen Special", there's a bit more fighting than normally, but nothing really excessive or bloody. There's also some light fanservice once or twice, though again, nothing to write to Congress about.